Well, it looks like I am holding steady around 190. Still. I have the last two weeks Mamavation to publish still. Do you ever get to a point where you are ashamed of your lack of progress? I joined Mamavation so I would have some sort of accountability as well as a support group of similarly focused women. In six months I have lost the same two freaking pounds over and over and according to my doctor there is nothing physically wrong with me. Well, my blood pressure was a little higher than normal, but all the bloodwork was normal. I digress. The point is, despite changing my diet, exercising more, and trying to lead a healthier lifestyle, it's not doing any good. I'm at my wits end. Join me for WEGO Health’s Webinar: Health Activism in Real Life! What: Health Activism in Real Life! The webinar is for anyone who’s interested in expanding their Health Activist reach and in bringing their online activist into their “real life”. As online Health Activists, our advocacy centers on utilizing the web for our outreach. By signing up for this webinar, we’ll learn valuable tips from Health Activist Jen Pettit, Sjogren’s Health Activist and blogger, and no stranger to getting face-to-face with her community to spread her Health Activism! Jen will share tips for starting your own organized event or simply for educating people in person about your condition. By signing up you’ll also have the chance to ask specific questions for WEGO Health and Jen Pettit and you’ll get access to the archived version of the webinar! Bent over, trying not to cry, putting on a brave face, can't miss another day of work...where's the damn Advil?!? Where's the oxy, some T3 would be nice ... Ahhhhh, heat. More Advil please! No, I am not suffering drug-induced withdrawal. It only feels that way. My back pain has been increasingly worse over the last two weeks. My chiro, who knows me so well, asked me to look at the calendar. Yup, I ovulated. That was the start. I just finished listening to the Audible presentation of Grave Secrets and as much as I love Bones and Tempe Brennan, I think I would have enjoyed this presentation more reading it or having a different narrator. I know it's not Music Monday, but this couldn't wait. I bought the Doowops and Hooligans album a few weeks ago and "Lazy Song " is definitely one of my favorites, I wake up to it on P90X mornings. This morning I finally saw the video and LAUGHED! Bruno Mars is such an amazing and talented performer. I had a FABULOUS weekend, even if I did end up gaining a pound this past week. The Hunk and I have been talking about camping for over a year now, I love it, but haven't had anyone to go with. My son didn't think I was capable of doing it even though I used to take him. Apparently getting my nails and hair done these days disqualifies me from being able to "rough it". A few weeks ago The Hunk was trying to surprise me with a reservation but wasn't having any luck. Research goddess that I am, I found an open beach-side reservation at McGrath State Beach. Before we got there, I didn't know that the campground would be closing soon. Our only criteria (by the time we got frustrated with Reserve America's reservation system), was beach and open some weekend in May. And not too far from Santa Barbara. McGrath is on the border of Ventura and Oxnard (before this past weekend I thought Oxnard was IE or up by Lompoc. It just *sounds* like it belongs in the Central Valley), about 30 minutes south of Santa Barbra on the 101. Perfect! We got a bit of a late start, but arrived at the campground before nightfall. We had a brand new Coleman tent (sleeps 10 or fewer and you can create bedrooms) that later proved entirely too roomy. Too much cold air! 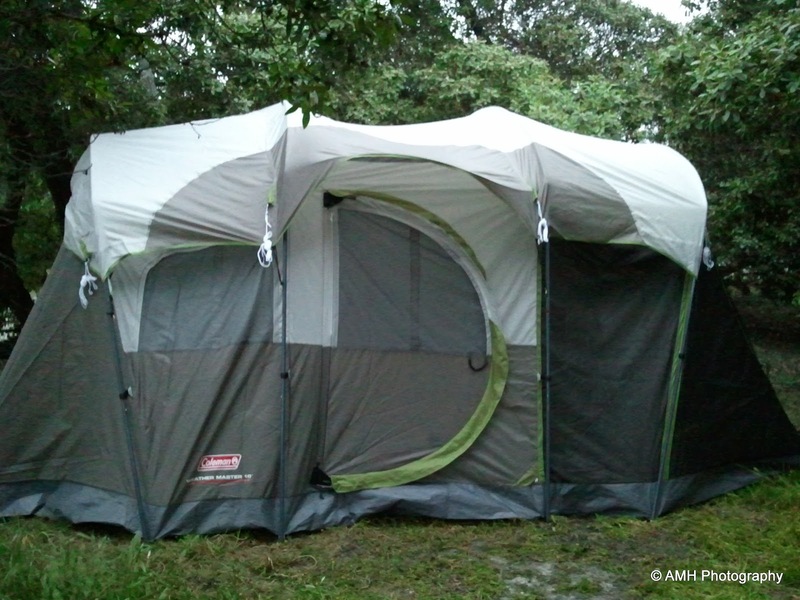 The tent advertised a set up of 20 minutes. Maybe if you knew what you were doing ... I haven't been camping in nearly a decade and was used to simpler setups. I'm not sure when the last time the Hunk went camping, but I have a feeling it was in childhood. An hour later after much arguing and trying to decipher the not entirely clear instructions we finally got it set up. It was color coded, go figure. Then it was dinner time (menu below the jump). After freezing our butts off all night, we woke up, had breakfast, and took a nice long walk on the beach. I left my phone in the car, so don't have any pictures of that, but it was gray, and windy, and cold. By lunch time we were ready to head up to Santa Barbara. We acted like tourists, rented bikes, saw a duck with one leg, ate some good food, and generally enjoyed ourselves. I felt renewed. The best part, I didn't have to cook dinner. 2011 Renaissance Pleasure Faire, a set on Flickr. All of these photos were taken with my phone. I hope to have my D80 with me when I go next week. This has been my tastiest breakfast all week. I say that deprecatingly. I wish I could be a kid again and get my fitness in like my daughter. Playing catch, riding bikes and scooters, playing in the pool. And soccer starts in July. I'm blessed in that we finally live in a place where I can tell her to go outside and play and she's like a bat out of hell going. 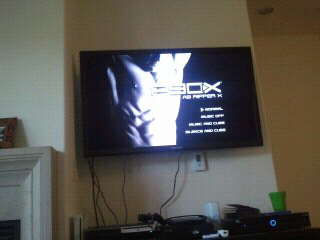 Me, I have to torture myself with P90x. I chose it partly because of Mamavation and partly because a lot of long time friends were sweating and swearing by it. One even joined me on Facebook and is doing another round (thanks Ben!) It also helps that The Hunk is working on his hunkiness with me. He pushes me when I want to quit and I give it right back to him when he wants to quit.